I had this beer at a 12 Percent Imports Rep. Tasting at State Line in October and it just screamed, Thanksgiving. 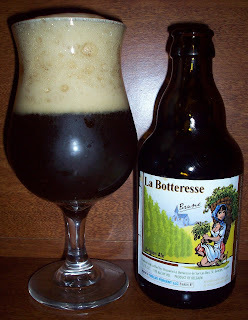 A unique Belgian brewed with Sage. This was the Entrée bier at this year’s Thanksgiving Bier Dinner. The beer pours a cloudy dark brown with a very rich off white almost tan head. This beer is almost opaque; there is just a dark haze showing through the glass. Sweet caramel malts and spices on the nose. The nose has the most interesting Belgian aromas. There are the typical Belgian yeasty notes and dark caramel malts but there are also the most unique spicy aromas on the nose, sage, coriander maybe and more. Oh my, this is Thanksgiving dinner in a glass. Really, I’m not kidding, well kind of kidding but I do feel like that girl Violate from Willy Wonka eating that prototype dinner candy. I start out tasting turkey then stuffing and then sweet creamy gravy over everything. I can almost pick up the spiciness of the tomato juice and the sweet candy sugar on the sweet potatoes. Sorry no Blueberries. The taste does start out with those sweet caramel malts then the high carbonation effervescence tingles over the tongue and the back end and finish are just packed with spices like sage. This is all with a very smooth and creamy final mouthfeel. It really is like your mouth was just coated with a liquefied Thanksgiving Dinner. This is one of the most unusual beers I’ve ever had. It is an extremely complex Belgian. Every sip of this beer I pick up something new. The craftsmanship in the beer is just outstanding. As it warms a little I’m picking up an almost tart taste on the final finish. You can also pick up more of those malts as it warms up a little. I just walked back into the kitchen and realized that I never did eat my dinner tonight. See I told you this was dinner in a class.